Jeff and Joan Stanford came west to Carmel, California to find careers in education, agreeing to help manage a small inn while looking for work. Jobs were scarce, the United States was in recession, and they found themselves enjoying their guests and rehabilitating the property they managed. The Inn allowed both of them to return to their former interests. Passionate about early education, Joan trained as a Montessori teacher and received her MA in psychology, specializing in Art Therapy, at Sonoma State University. Today she is a registered art therapist, collagist, and educator. Jeff became vegetarian as a first step to honor all life, not only the lives of his family, friends, and pets. He and Joan sought to create an inn that sat softly upon the earth. They created one of the first “green” bed and breakfast inns without realizing they were doing so. Understanding that their Inn was a destination, Jeff and Joan wanted to provide the highest quality food to their guests, which Jeff began cooking in the early 1990s. The restaurant followed their philosophy serving a whole food, plant based dishes designed to rival the cuisine found at the highest rated restaurants in the San Francisco Bay Area. Caryn Hartglass: Hello everybody, hey there. I’m Caryn Hartglass and you’re listening to It’s All About Food, of course you are, that’s why you’re tuning in, because you want to hear, you want to hear about food, right? Well, before we get started, well actually we have gotten started, haven’t we? But before I bring on my guest, I want a little pity party here. You may remember last week, I was broadcasting from my bed with a fever and that fever lasted an entire week. I cannot believe it, but I had the worst flu probably that I can ever remember and fortunately the fever broke on Sunday and I am on the mend but that doesn’t mean it’s easy, and I hope, I hope I’m not going to do any of the hacking that I’ve been doing most of today so I’ve got a lovely pot of green tea right by my side. Keep me hydrated, lubricated. And I think a while later I’ll moan and groan a little bit more about my pathetic state. Vegans aren’t supposed to get sick, right? Wrong. Whoever said that, but I would like to figure out how this flu came to me and I know that it’s something that I will never, never know. 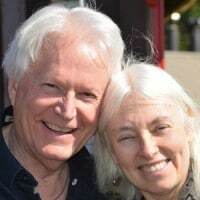 Now onto happier things because I am so excited about bringing on my guest, Jeff and Joan Stanford from the Stanford Inn by the Sea in Mendocino, California. Are you with me? Joan Stanford: Yes, I’m glad you’re feeling better. Caryn Hartglass: Thank you Joan, and is Jeff there too? Joan and Jeff: (laughter) You don’t know us. Caryn Hartglass: Oh great, you guys are adorable. I have to tell you, I don’t know you, I wish I did. I love your story. I’ve known about your place for a very long time. These are all my own little “I’m Sorry”, Mea Culpas, whatever. I don’t know why we’ve never made it to your inn. I lived in the Bay Area for about nine years until the early nineties and then I commuted there for the longest time. My partner is from San Jose, we visit all the time. I’ve said almost every trip for like the last fifteen years, “We have to get to Mendocino and it just hasn’t happened. It will happen. Caryn Hartglass: And so I’m looking at your stunning cookbook, dining at the Ravens and I really didn’t know how the story began and I hope you can just share a little bit about that before we dig into the deliciousness of it all because it’s something I think a lot of people fantasize about and few people really make it happen and get their hands dirty or invest the 35 years to make it happen. Joan: And our values, and it’s been a great life for us so I encourage, I don’t mean to discourage people that have the fantasy but it is a challenge, there’s many challenges. Jeff: Yes. The point is that we didn’t go into this with this particular dream. We did not have a vision. But what we did was quite different than that. We let the vision come to us, to manifest as we were doing it and I understand that people have visions like that wonderful, wonderful man Trump has a vision of becoming president and (cuts out) to become president. We have nothing like that. What happened was in the beginning; we had a really bad partnership that went really South. We were living in Carmel at the time and Joan had fallen in love with this area and we had no idea that we could even get in here. We were looking at more marginal areas where the prices would be less. We were all on borrowed money. Joan and I had 22,000 dollars and that was it. And most of that wasn’t even in real money it was like wedding gifts that we never really returned and stuff. We’ve been married for just a short while-but, well, four years- but anyway, the point is that we have an openness to experience. We, one of the things is that, we both understand is that we can be wrong so we just plow through and when we were wrong, we corrected it like when I realized that I was having somebody kill animals that I wouldn’t do for myself that was an unethical thing so I quit eating meat. I learned about dairy twenty years later and I quit eating that. Not that I ate very much of it anyway. So I have a leaf in my hair, apparently. I was out in the wild, taking the dog out. But in any case, the fact is that the vision basically manifested by listening to, just feeling what was going on this land. And there we have an advantage, we’re on land, we’re in a rural area, we can walk on grass, we don’t, it’s not all green, in the summer it’s brown but you know, you lived out here. The point is that things changed and by noticing them it changed us like Joan, tell your story about the trees. Joan: Well, is this in the book? Joan: It’s not. Early on here, like when we first came in ’80, I remember standing out on the deck and thinking “Oh, this is just so beautiful, wouldn’t it be nice if we had a better ocean view or a ocean view.” I don’t think we any at that point. Caryn: Oh, yes it is in the book, but tell it. Joan: Oh so it is in the book? Joan: Ok, so then what happened was I think it was that first winter when we had a lot of rain, like we’ve had just these last few days. And this band of cypress on a lower road like literally fell over, like their roots couldn’t hold them anymore. It was almost like they sacrificed themselves for my wish. And I felt like the land was really welcoming us in that respect. I mean you can get more esoteric about it but I felt, and I said this recently to someone else: it felt like the land recognized that we were here and we were the right people to be here, that we had that custodial relationship rather than a strictly developmental, and then abandon mentality that some people that fit into the business have where they make it quickly and they’re not really invested. I think the new the land, I mean I my sense is that if the land understood or we understood something about the land, it was a co-creative thing right from the beginning and I was pregnant at the time I mean I was, we we’re going to have our family here which is why the original owners helped us get it and made terms that we could manage. You know, they wanted somebody; they wanted new people in the area that were going to be connected to the area. They saw this sort of trend of outside people coming in and they didn’t want that, they wanted Mendocino to have that same village feel that it did have in the past. Anyway, I’m off the track here but anyway, that was the story that Jeff wanted me to tell with the trees falling. Jeff: Feel free to interrupt at any time. Jeff: Just like our children. Joan: Yeah, that’s a great story. Do you want us to tell that one? Caryn: Of course! Of course! I loved it! Joan: Ok, Jeff you tell. Caryn: Is it a tough one to tell? Caryn: We have plenty of time, Jeff. Maybe we can talk about your belief system in a moment, but let’s talk about the Ravens first. Jeff: No, no that’s what we’re going to talk about. So in 1995, we were visiting my dad in Carmel and we were-the kids were out ahead of us, well actually I was with them mostly-pedaling these little surreys that they have in New Monterey and my step-mom and my dad and Joan and I were walking. I was kind of hanging out with my step-mother, Joan was talking to my dad, and my dad points to-I saw this, I didn’t really hear all of it-he points to a black bird which he thought was a crow because we’re from the Mid-west, he didn’t know the difference, and he points and says “If anything happens to me, I’m coming back as one of these black birds, as a crow.” And so that was like April 4th, on May 18th, he died, on May 31st, the first two pair of ravens appeared here that have never been here before, not in the 15 years that we lived here nor in the memory of any local had there been ravens here. There was a theory that I learned later. There had been ravens but people had killed them all. But there were none on the coast in any case for I don’t know, 50-60 years, maybe even more. Just nobody knew about them. Anyway, they appeared, they’re over, they’re hundreds of them now and so that’s why we named the building where the ravens originally arrived, “The Ravens”. And they were on a tree where the building is now; we’re in that building today. Caryn: Ok, I love that. Joan: And they’re also, in systems of mythology, they’re kind of a trickster character. They transgress from one world to the other in story and they’re very very clever. They love mirrors, they love to play with things, they’re very interesting actually. Jeff: Yeah, they’ve played on our equipment where the footprint of The Ravens restaurant is now. That’s where the compiles were and we have a backhoe and a dump truck to move that stuff around. Caryn: Well, that raven community was just waiting and when you arrived they new it was safe to come back. Jeff: Yeah, they waited 15 years though. Something had to happen that moved them here, like they carried my dad’s words with them. Caryn: Yeah, wow. Alright, now you’ve literally changed this place with your hands, digging in the dirt, creating gardens, planting gardens, landscaping, building, reconstructing, refurbishing, so much physical labor, and love. And you’ve created a beautiful place; I’ve seen the pictures. And now, we’re going to focus on the food, because this show is all about food and delicious, vegan, plant-based food. The only food we should be eating on the planet and why anyone would choose to eat anything else is way beyond me. But that’s one of my mysteries. Jeff: It’s cultural. Well it’s cultural, and it’s part of their identity. I don’t know long you’ve been dealing with confrontations about it, but we have…although we were always a vegetarian-we served vegetarian breakfast in 1991 to the time that we opened the dining room in ‘96- people actually got mad because we put it in front of them that we were vegetarian, that the restaurant was vegetarian. We didn’t have breakfast meats. Their anger was significant, that was the first large loss of guests that we had. I mean, people would yell at me in the lobby, which was brand-new, we had opened it in ’96, and about giving them a choice to eat other things. It wasn’t even half as bad when we went vegan and took away eggs. We had already taken eggs and dairy out of everything that we served that we made, that we prepared like scones and all that, they’d been vegan for a long time, people didn’t even know they were eating vegan hollandaise. But basically, if you were local, you would have to pay two dollars extra for eggs on something to make them aware and if they were guests, we would just do the eggs. But the cognitive dissonance that I experienced of having been vegan for so long and still serving that stuff, I gave myself a Christmas present, Joan and I gave ourselves Christmas presents, but actually that’s the part that I run, and we made it vegan several years ago and I feel a lot better. I think the energy around here feels a lot better, too. Caryn: And when did that happen, when did it go completely vegan? Joan: You’re talking about the breakfast? Because the night was vegan. Jeff: The breakfast. Yeah, the night was vegan since 2007. So it was just the breakfast that was a problem for us. But I’ve been vegan since 2004 so it was a lot of cognitive dissonance for me I mean it really was a problem because I understood that torture and the problems with the animals and I know that there’s healthy and ethical vegans and I didn’t even know there was a dichotomy when I made these choices starting back in 1985 is when I became vegan, or vegetarian. But it was always a question of animals, it wasn’t about me. Why do I need to eat this? This is going to cause somebody else to suffer. It would be like if you could only make this by some cook getting burnt, then don’t eat whatever it is. It’s the same thing with the animals; don’t eat it because they’re going to suffer for it and that’s why I changed and we really are low-oil to no-oil, whole foods here. The recipes in this cookbook reflect a reduction in oil and all that but they are restaurant recipes but we’ve been working the last year to completely change all our recipes to using as little as that-being as whole foods as possible. And many of them are in the cookbook but we’re continuing to develop more and new ones and as a result we’re working on a whole variety of ethnic foods because frankly, it’s hard to take the nouveau California, the French California combined kind of approach to cuisine and avoid fat. Whether its plant fat or animal fat, that doesn’t really matter. It’s very hard to avoid it because they combine… We don’t even try to copy that food anymore but we did originally, we tried to get that essence of that very high-end Gary Denko kind of restaurant and I think we were very successful with it where we had a very high rating because of that and since then, we’ve continued keeping the food at that level of quality but with the focus on using whole foods which means that we now dropped a bunch of things that use to sauces and the like and actually they’re not in this cook book. We have an earlier cookbook, those things were not put in this cookbook. Caryn: Well, food is fascinating and over the decades, things that we think were healthy, we discover maybe they’re not so, and we move onto new schools of thought. I remember in the 80’s when I was putting wheat germ on everything, thinking that was really good for me and I would never use wheat germ today because it’s not even a whole food. And there are just so many things that I remember thinking were good for me. Now part of the value in any of that is if we believe we get this placebo effect and it may not have any judgmental effect on us because the placebo effect can take care of that, making us think that it’s really good for us and the body acts like it is. But meanwhile in the world of vegan cuisine, there’s been so much change and you both have been so courageous because running a place like this, you are open only to criticism all the time, especially from Americans who want it their way and are never happy. And you have this thing to balance, which is people who are omnivores and that people who are vegans, that if you are not the most environmentally-friendly, and you haven’t thought through every single ingredient, making it no oil an whole foods and palm oil- free, every little thing, I mean every food has a story, every food has social issues, and we can’t do it all to please everyone. Caryn: No, I absolutely agree with you and when you’re appealing to a wide range of clientele. Especially people who don’t know this food, it needs to be a little saltier, it needs to be a little richer, it just needs to be in order for them to feel that same level that they’re used to with animal foods. Jeff: But we’re lucky. We’re lucky. We had 60% of our guests come from the Bay Area, and that’s a remarkably open group of people, particularly after the last 5-6 years, the Millennials are becoming our guests now. And they are much more aware than maybe people we give them credit. I don’t know, I have no issues with the sole concept of the Millennial generation, they seem very wise. They are active; they move around a lot, they appreciate a lot of what we’re doing. The really difficult vegans that are around- and there are a few- they’re very small-numbered. Many of them understand that a place like this is educational and that’s how we look at it. We were in the process of avoiding all; well we already look for palm oil bases as certified that’s not in a forest that orangutans are in. We’re very careful about all of that. But somebody had to point that out to us that there was a (cuts out), but we’ve actually been aware of that problem since this stuff got popular, so for many years now. And we’ve been trying to deal with it and we’re using coconut oil much more now and it’s basically making our own butter to put in these things. But the fact is that we want to introduce as many people that will be making decisions for other people and also talking to other people that become leaders. We want to affect them. A lot of people are just followers and they might be the ones that are arguing all the time. They’re following a good thing, they’re vegan followers, but we need to get to leaders in California in schools, and we get guests from all over Europe and Japan. We need to touch them so that we give them information and help in passing the word around like I just finished an article on… Well actually I didn’t finish it, I wrote it a long time ago, but I keep adding to it reasons why we were always herbivores that could eat meat. So it’s now 11 really good, scientifically- based reasons for the fact that we’re herbivores. You can find most information on the net and not all the reasons are necessarily in the same article but we assemble them and put them out there. People read that and they begin to understand what it is we’re trying to do. We’re trying to keep people healthy and do that by showing that the vegan diet can be joyful and fun and when you leave the table you don’t feel logy or anything like that. You’ve got energy. Caryn: What was that word you just used, you don’t feel what? Jeff: Logy. It’s a word meaning feeling heavy and down. Caryn: Ok, logy. That’s a good one. All right we just have a few minutes, and I want to jump into your cookbook a little bit if we can. The first thing that popped out to me was the Citrus Polenta. We make a lot of polenta at home and I’ve never made it with citrus and obviously, that’s something I’m going to do very soon. Joan: That’s one of our most popular items. Jeff: Yeah, it’s very popular. That was developed by Dominica Patelli, when we first opened for breakfast in 19-basically-’96. She was the person I worked with, she is the one who relieved me of cooking. I love Dominica. She has a restaurant now with her brother in Geyserville. It’s not vegan or vegetarian either, but she was vegetarian. Caryn: Okay, boo-hoo. Oh well. Joan: That’s hard for me. I never understand how you go the other direction, but anyway, people do. Jeff: It has to do with a cultural identity. She’s Italian-I’m not making excuses- she’s Italian, her father was a cook, her brother is a cook, and it’s about money. You can make a living much more easy than what we do. So, the rooms that we rent here allow us to do what we want to do with the restaurant. Guests can go wherever they want to eat, but this building is vegan. And the people that live here- we have interns living here- they have to be vegan. We don’t allow any animal products brought onto these premises. In the rooms, people can do what they want to, they’re renting the room. It’s like renting an apartment. But here, this is a public space, and it’s a vegan public space. Caryn: Exactly. Well, again, you have been extremely courageous and I’m so glad that you’re leading the way, showing the way and hopefully other people that are learning through being at the Ravens or in other places will follow suit and not go in the other direction. Jeff: I hope not. Well, you know, what happened was, in the late 90’s, we saw just a huge burgeoning of vegetarians, there are a lot of vegetarians around. There was a doctor that would come up, Elson, I can’t of his last name, but he would come up from the Bay Area and work around, do seminars on vegetarian living. And actually, at another place, a restaurant. And quit, he one time came back and just was staying with us, he was not doing that work anymore and he and I talked I said “Boy, there were a lot of vegetarians around, they all went away,” and he said, “Yeah, they all went to the Atkins diet.” So they were health vegetarians or weight vegetarians or whatever they were and they didn’t have that trans-personal, trans-species look at it and I think it’s more of an ethical point-of-view, where you just don’t do that kind of eating because it’s so destructive and it’s so cruel. It’s hard because every now and we’ll run into a vegan guy who says, “I’m a vegan, oh but I eat fish.” And, why? Fish are first of all, he thinks it’s healthy, but fish carry a lot of toxic metals. It’s the least healthy meat you can eat. And so that’s not an ethical vegan. And I think ethical, by approaching this ethically, you’ve got all your problems solved. You don’t have to worry about your health anymore because it takes care of you. And that’s what we try to do. Our newsletter that we give to our guests, every one of them, is really an argument for that. And we have good medicine, the PCRM thing in all of our rooms. People, it’s just making that one decision takes care of so many problems and gets rid of that cognitive dissonance, that conflict within them that actually impairs personal growth. I found that when I made the… yeah? Caryn: Well, unfortunately we’ve cut to the end of the half hour. But I wanted to say that it’s very obvious to me how you’ve been able to, for the last 35 years or so, build this beautiful place. You are fueled with quite a bit of passion for the vegan movement. Excuse me? Caryn: Oh I definitely, definitely will. I can’t stand talking about it anymore. I want to get there and we’ll do it as soon as we can. Look forward to meeting you. Joan: And feel better, thank you so much. Jeff: I actually don’t know, where are you? Caryn: I’m in New York. Joan: We love New York, I love New York. Jeff: Oh, okay. We used to go there a lot, our daughter was going to NYU. Caryn: Oh my goodness, what a wonderful school. Yeah, well, I just wanted to say this book, Dining at the Ravens: Over 150 Nourishing Vegan Recipes from the Stanford Inn by the Sea, beautiful recipes, a lot of comfort food-looking dishes. Delicious. So thank you for putting that together and thanks for joining me on It’s All About Food. Jeff and Joan Stanford of the Stanford Inn by the Sea.